Easy-to-install Adjustable Keyboard Platform tray is ideal for home/home office use or situations where set-up help is limited. Platform holds virtually all keyboard types. Star knob control for height and tilt adjustment; 360° swivel. Full-length leatherette gel wrist rest. Precise™ optical mousing surface. Endorsed by the American Physical Therapy Association. Tool-Free Installation in under 10 minutes in Four Easy Steps – Fits work surfaces 1" to 1 1/2". Patent pending clamp securely grips front edge of desk using hand-tightening screws. 3M™ Command™ Adhesive holds back of track securely in place and removes cleanly if needed. Mounting screws are included if traditional installation with tools is desired. Workstation Type—Straight Glide Track Length—17-3/4"
Star-knob adjustment controls height and tilt simultaneously. 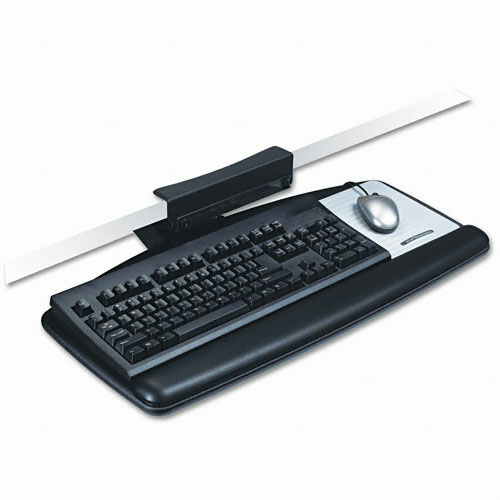 Gel wrist rests for keyboard and mouse platforms add comfort by minimizing pressure points. Leatherette cover lasts longer than fabric-covered wrist rests and is easier to clean. Single platform accommodates both keyboard and mouse. 3M™ Precise™ Optical Mousing Surface can be positioned to the left or right of the keyboard. Installs without tools, typically in less than 10 minutes. Keyboard tray glides along with just a touch and can be stowed completely under the desk.